In the morning, Alyona brought me to the station with the tram, where a woman sold the tickets on board. The train was already there, but I had to wait to get in. My passport was doublechecked and I entered a clean new waggon (you might be less lucky if you try to take a train in Russia) where a comfortable bunk bed, linen, a pillow, a blanket and free hot water from a fascinating machine were available on the long long ride. And long it was. Fortunately, I shared my compartment with two nice Russian women and Michael, a bald ship engineer with a nice moustache who had seen the world, or at least an array of harbours on all of its continents. It was interesting talking to him, although – his English was just slightly better than my Russian. But we had time! O ye s, we had time. 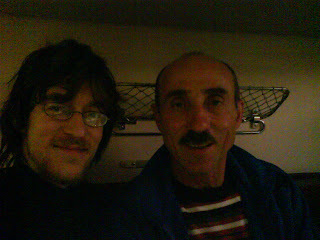 And using our meager shared vocubulary, hand and feet gesturing being of some help, we spoke about traveling, about Russian literature (admittedly, we only did some name-dropping), and then I asked him how he felt about Obama. “Well, I very glad”, he said. “And do you know “Voyna i mir” (War and Peace)? Yes, yes. “Bush – voyna; Obama – mir. We were fond of that association and laughed, catching the attention of the woman sleeping below me on the bunk bed. “What are you talking about?” she asked in Russian. “Politics!” I think that is a funny situation: give two men a few words and they already start talking politics. Yes, it felt great, and I wrote a few pages while Michael read some Rasputin. When the bumping of the train got nasty, I stopped writing and went to bed.